In 1920 Miss Greta Gustafsson, aged fourteen, applied for a job at PUB, one of Stockholm‘s largest department stores. She was hired as a shop assistant, paying $ 25 a month. Through her job in the hat department, she was asked one day to show the spring models. 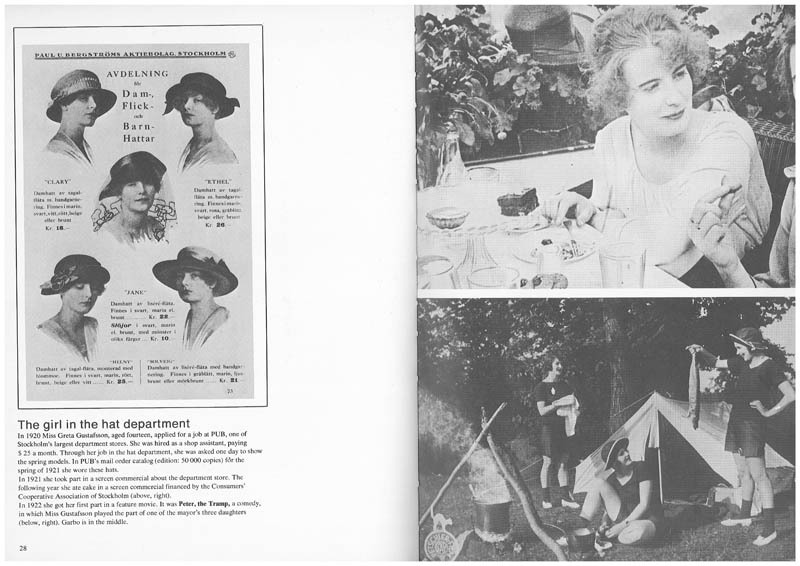 In PUB‘s mail order catalog (edition: 50 000 copies) for the spring of 1921 she wore these hats. In 1921 she took part in a screen commercial about the department store. The following year she ate cake in a screen commercial financed by the Consumers‘ Cooperative Association of Stockholm (above, right). In 1922 she got her first part in a feature movie. It was Peter, the Tramp, a comedy, in which Miss Gustafsson played the part of one of the mayor‘s three daughters (below, right). Garbo is in the middle.